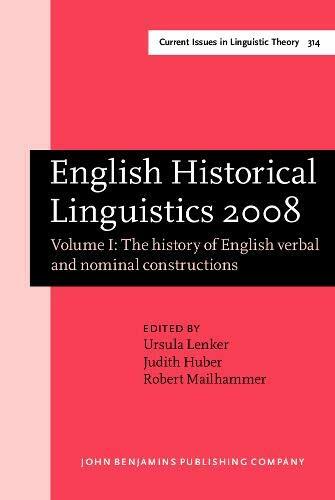 [PDF] English Historical Linguistics 2008: Selected papers from the fifteenth International Conference on English Historical Linguistics (ICEHL 15), Munich, ... (Current Issues in Linguistic Theory) | Free eBooks Download - EBOOKEE! Description: The fourteen studies selected for this volume â€“ all of them peer-reviewed versions of papers presented at the 15th International Conference on English Historical Linguistics 2008 (23â€“30 August) at the University of Munich â€“ investigate syntactic variation and change in the history of English from two perspectives that are crucial to explaining language change, namely the analysis of usage patterns and the social motivations of language change. Documenting the way syntactic elements have changed their combinatory preferences in fine-grained corpus studies renders the opportunity to catch language change in actu. A majority of studies in this book investigate syntactic change in the history of English from this viewpoint using a corpus-based approach, focusing on verbal constructions, modality and developments in the English noun phrase. The book is of primary interest to linguists interested in current research in the history of English syntax. Its empirical richness is an excellent source for teaching English Historical Syntax. No comments for "[PDF] English Historical Linguistics 2008: Selected papers from the fifteenth International Conference on English Historical Linguistics (ICEHL 15), Munich, ... (Current Issues in Linguistic Theory)".